Some elements of The Merry Wives of Windsor may have been adapted from Il Pecorone, a collection of stories by Ser Giovanni Fiorentino; one of these stories was included in William Painter's The Palace of Pleasure. The play's date of composition is unknown; it was registered for publication in 1602, but was probably several years old by that date. Textual allusions to the Order of the Garter suggest that the play may have been intended for performance in April 1597, prior to the installation in May of the Knights-Elect of that order at Windsor ; if so, it was probably performed when Elizabeth I attended Garter Feast on April 23. This was not necessarily the premiere; presumably, the play was also staged at the public theatre. However, support for this theory is divided. If the Garter theory is correct, it would mean that Shakespeare wrote 'The Merry Wives of Windsor' between Henry IV part 1 and part 2. Critics have trouble believing this because of all the inconsistencies that appear between the Henry plays and Merry Wives. For example, there are no references to any of the major events going on at the time such as the rebellion (Henry IV part 1), or the English invasion of France (Henry IV part 2). January 18, 1602 was the date the play was entered into the Register of the Stationers Company. The first quarto was published later that year, in an inferior text, by bookseller Arthur Johnson. It was published in a second quarto in 1619, as part of William Jaggard's False Folio; the superior First Folio text followed in 1623. The title page of Q1 states that the play was acted by the Lord Chamberlain's Men, "Both before Her Majesty, and elsewhere." The earliest performance known with certainty occurred on November 4, 1604, at Whitehall Palace . Another known performance took place on November 15, 1638, at the Cockpit Theatre . The play alludes to a German duke, who is generally thought to be Frederick I, Duke of Württemberg, who had visited England in 1592 and was elected to the Order of the Garter in 1597 (and who was eventually only installed in Stuttgart on November 6, 1603). There is an indication that Falstaff in Merry Wives was originally called Sir John Oldcastle, as was true of Falstaff in the Henry IV plays. See: Sir John Oldcastle and Sir John Fastolf. Messrs. Ford & Page, two Gentlemen dwelling at Windsor. Rugby, a Servant to Doctor Caius. The Host of the Garter Inn. Falstaff arrives in Windsor very short on money. He decides, to obtain financial advantage, that he will court two wealthy married women, Mistress Ford and Mistress Page. Falstaff decides to send the women identical love letters, and asks his servants – Pistol and Nym – to deliver them to the wives. When they refuse Falstaff sacks them and in revenge the men tell Ford and Page (the husbands) of Falstaff's intentions. Page is not concerned but the jealous Ford persuades the Host of the Garter to introduce him to Falstaff as a 'Master Brook' so that he can find out Falstaff's plans. Meanwhile, three different men are trying to win the hand of Page's daughter, Mistress Anne Page. Mistress Page would like her daughter to marry Doctor Caius, a French physician, whereas the girl's father would like her to marry Master Slender. Anne herself is in love with Master Fenton, but Page had previously rejected Fenton as a suitor due to his having squandered his considerable fortune on high-class living. Hugh Evans, a Welsh parson, tries to enlist the help of Mistress Quickly (servant to Doctor Caius) in wooing Anne for Slender, but the doctor discovers this and challenges Evans to a duel. The Host of the Garter prevents this duel by telling both men a different meeting place, causing much amusement for himself, Justice Shallow, Page and others. Evans and Caius decide to work together to be revenged on the Host. When the women receive the letters, each goes to tell the other and they quickly find that the letters are almost identical. The "merry wives" are not interested in the aging, overweight Falstaff as a suitor; however, for the sake of their own amusement and to gain revenge for his indecent assumptions towards them both, they pretend to respond to his advances. This all results in great embarrassment for Falstaff. 'Brook' says he is in love with Mistress Ford but cannot woo her as she is too virtuous. He offers to pay Falstaff to court her, saying that once she has lost her honour he will be able to tempt her himself. Falstaff cannot believe his luck, and tells 'Brook' he has already arranged to meet Mistress Ford while her husband is out. Falstaff leaves to keep his appointment and Ford soliloquies that he is right to suspect his wife and that the trusting Page is a fool. When Falstaff arrives to meet Mistress Ford, the merry wives trick him into hiding in a laundry basket ("buck basket") full of filthy, smelly clothes awaiting laundering. When the jealous Ford returns to try and catch his wife with the knight, the wives have the basket taken away and the contents (including Falstaff) dumped into the river. Although this affects Falstaff's pride, his ego is surprisingly resilient. He is convinced that the wives are just "playing hard to get" with him, so he continues his pursuit of sexual advancement, with its attendant capital and opportunities for blackmail. Again Falstaff goes to meet the women but Mistress Page comes back and warns Mistress Ford of her husband's approach again. They try to think of ways to hide him other than the laundry basket which he refuses to get into again. They trick him again, this time into disguising himself as Mistress Ford's maid's fat aunt, the fat woman of Brentford. Ford tries once again to catch his wife with the knight but ends up beating the "old woman", whom he despises, and throwing her out of his house. Black and blue, Falstaff laments his bad luck. Eventually the wives tell their husbands about the series of jokes they have played on Falstaff, and together they devise one last trick which ends up with the Knight being humiliated in front of the whole town. They tell Falstaff to dress as "Herne, the Hunter" and meet them by an old oak tree in Windsor Forest (now part of Windsor Great Park ). They then dress several of the local children, including Anne and William Page, as fairies and get them to pinch and burn Falstaff to punish him. Page plots to dress Anne in white and tells Slender to steal her away and marry her during the revels. Mistress Page and Doctor Caius arrange to do the same, but they arrange Anne shall be dressed in green. Anne tells Fenton this, and he and the Host arrange for Anne and Fenton to be married instead. The wives meet Falstaff, and almost immediately the "fairies" attack. Slender, Caius, and Fenton steal away their brides-to-be during the chaos, and the rest of the characters reveal their true identities to Falstaff. Although he is embarrassed, Falstaff takes the joke surprisingly well, as he sees it was what he deserved. Ford says he must pay back the 20 pounds 'Brook' gave him and takes the Knight's horses as recompense. Slender suddenly appears and says he has been deceived – the 'girl' he took away to marry was not Anne but a young boy. Caius arrives with similar news – however, he has actually married his boy! Fenton and Anne arrive and admit that they love each other and have been married. Fenton chides the parents for trying to force Anne to marry men she did not love and the parents accept the marriage and congratulate the young pair. Eventually they all leave together and Mistress Page even invites Falstaff to come with them:"let us every one go home, and laugh at this sport o'er by a country fire; Sir John and all". Merry Wives was one of the first Shakespearean plays to be performed once the theatres re-opened in 1660 after the Interregnum. Samuel Pepys saw the King's Company act it on Dec. 6, 1660, and again in 1661 and 1667 (though he didn't like it, anytime). 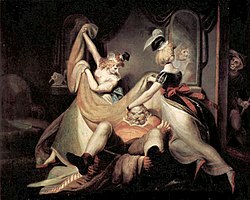 In 1702 John Dennis offered an adaptation (it has been called a "perversion") of the play, titled The Comical Gallant, or the Amours of Sir John Falstaff — which flopped. In 1824 Frederick Reynolds included Merry Wives in his series of operatic adaptations, with music by Henry Bishop. Charles Kean returned to Shakespeare's text in an 1851 production. Key themes of Merry Wives include love and marriage, jealousy and revenge, social class and wealth. Explored with irony, sexual innuendo, sarcasm, and stereotypical views of classes and nationalities, these themes help to give the play something closer to a modern-day view than is often found in Shakespeare's plays. The play is centered on the class prejudices of middle-class England. The lower class is represented by characters such as Bardolph, Nym, and Pistol (Falstaff's followers), and the upper class is represented by Sir John Falstaff and Master Fenton. Shakespeare uses both Latin and misused English to represent the attitudes and differences of the people of this era. Much of the comedic effect of the play is derived from misunderstandings between characters. Another prominent Elizabethan theme that runs through the play is the idea of the cuckold. Elizabethans found the idea of a woman cheating on her husband absolutely hilarious and seem to have assumed that if a man was married then his wife was cheating on him. Because a cuckolded husband was said to "wear horns", any reference, no matter how oblique, to horns or a horned animal (for example, the "buck" basket where Falstaff finds himself) probably brought down the house. Most critics consider Merry Wives to be one of Shakespeare's weaker plays, and the Falstaff of Merry Wives to be much inferior to the Falstaff of the two Henry IV plays. That Shakespeare would so stumble with one of his greatest creations is puzzling and a satisfactory reason for this remains to be found. The likeliest explanation, if the Garter Feast theory is accepted, is that the play was written hastily, to order for a special occasion, within severe time constraints and rushed to meet a Royal deadline of possibly as little as only 14 days. It has also been said that Shakespeare was one of Queen Elizabeth I's favorite playwrights and that she so enjoyed the buffoon Falstaff that she personally requested that Shakespeare write an entire comedy surrounding Falstaff. This would explain the powerful female characters as a bow to the queen and grand slapstick comedy surrounding Falstaff's mishaps in the play. The play was revised and adapted by John Dennis in 1702 as The Comical Gallant. The composer Antonio Salieri wrote the opera buffa Falstaff (1799), with a libretto by Carlo Prospers Defranchesi, which also adapts the main story line of The Merry Wives of Windsor for the operatic stage. The German composer Carl Otto Nicolai wrote an opera based on the comedy in 1849, Die lustigen Weiber von Windsor. Giuseppe Verdi's last opera, Falstaff, with a libretto by Arrigo Boito, is based on the play, although, as with most operas adapted from the theatre, there are significant differences as to characters and plot. The English composer Ralph Vaughan Williams wrote Sir John in Love, an opera based on this play in the years 1924–28. The Merry Wives of Windsor – HTML version of this title. The Merry Wives of Windsor – Searchable, scene-indexed version of the play.